“Venus” is a brand new XL pack by Production Master, ideal for people who want to mix Pop and Trap music and dominate the charts with the trendy vibe that has taken over the world. With an ever growing popularity, pop trap and post trap is gaining ground and slamming charts everywhere. Artists like The Weeknd, Post Malone, ZAYN, Frank Ocean, Khalid are now some of the biggest streamed artists ever and female singers like Halsey, Melanie Martinez, Evan Giia, Lana Del Rey, Bebe Rexha and Doja Cat are filling up the gaps in those charts. Enter “Venus”, a pack so grand we had to name it after the roman goddess renowned for love, beauty, desire and sexuality… Which is also what a lot of the lyrics of this pack touch on. Big trap beats with smooth female pop-like vocals, that is what you can expect from this original library. “Venus” features 11 full vocal tracks by Czech born singer Anna Zitnikova, who has also sang on the top Production Master vocal sample pack “Essence”. Included are 11 full songs with harmony stems, ad-lib stems and various variations per song, so that you can mix and match the vocals and layers needed for creating your hit record! Every song features original lyrics (themes are love, beauty, desire and sexuality) and each song has an intro, chorus, verse 1, verse 2 and bridge. Plenty of vocal content to make hit records! Every vocal is delivered as wet and dry version and all vocals were recorded with a Neumann microphone for maximum clarity. 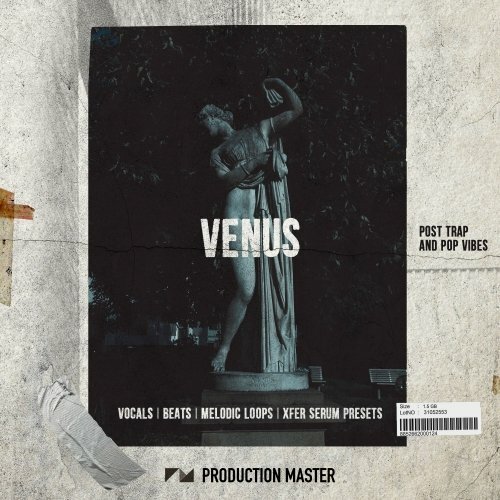 “Venus” features 25 wavetables and 101 Xfer Serum presets, fully macro’d, covering all needed instruments for pop trap. All presets feature top quality FM synthesis and are made to be not just useful, but to become your go-to library for pop and trap. Get down with sick 808 basses, skillfully crafted instruments and leads, bright synths, ear pleasing keys and more. Use them as given or learn on how to construct these sounds by reverse engineering… or twist them up into your own sound. The choice is yours!